Accounting is the action or process of keeping records of financial transactions, especially where it concerns companies; an online accounting degree has become a popular way to gain the credentials to enter a career as an accountant. While there are many functions of an accounting department within a company, the general duties are to ensure the proper management of funds. People who enjoy math and have excellent analytical skills will enjoy a career in accounting. Contrary to popular belief, accountants are actually very social, customer service-oriented individuals as a result of their work environment. They work normal business hours but perform a wide variety of different tasks throughout the year. From figuring out personal and business taxes to balancing complex spreadsheets, accountants need to be focused, self-motivated, pay close attention to detail and be willing to work diligently. Those who love numbers and providing solutions to many different financial problems will do well in an accounting career. Accountants typically need a bachelor’s degree in order to practice professionally. However, this isn’t always the case. According to the U.S. Bureau of Labor and Statistics, some companies hire accountants without a four year degree. These include bookkeepers, accounting clerks and junior professionals who lack the same privileges as full-time accountants. It’s possible to get an accounting certification from a technical school or community college, but by and large most accountants hold at least a bachelor’s degree in accounting. In fact, many accountants choose to get a master’s degree in accounting or business administration because they’ll be more competitive in the job market. Like any job, accounting offers advantages and contains disadvantages. On the positive side, accountants usually work a 40-hour per week schedule during daytime hours, which means they can spend time with friends and family on weekends and holidays. They earn a decent salary and can expect good job growth, as discussed in detail below. The downsides for accounting include a hectic spring schedule, as tax season presents many different challenges. While accountants love math and numbers, their day-to-day work is very taxing and can lead to mental stress. They also hold a great deal of responsibility because they handle people’s money and investments, which means they may face irritable clients and a stressful working environment on occasion. Asking yourself and the school important questions early can help you make a more informed decision. Because accounting is a constantly growing industry, there are thousands of schools offering good programs. The key is finding one that works with your schedule, budget and future goals. Walden University: Founded in 1970, Walden University has been offering quality instruction to its many students. In 1995, the school began offering online programs and is nationally renowned for their emphasis on a research-based approach to education. With 10 degrees at the certificate, bachelor, graduate and doctoral levels, Walden offers many different options for those considering an online accounting degree. Southern New Hampshire University: In 1932, Southern New Hampshire University, then under a different name, established itself as primarily an accounting and secretarial school. While it has since become a renowned business school offering a variety of majors and focuses, SNHU remains at its heart an excellent school for accounting. They offer two bachelor’s degree programs and one master’s program online in accounting. National University: As the second largest school of higher learning in California and one of the top schools in the country, National has earned its place in a list of top accounting schools. Since 1971, the school has been offering excellent instruction while keeping its mission of diversity. They currently offer an associate’s, bachelor’s and master’s degree in accounting through their online program. If you’re wondering about the tuition for these and other online programs, unfortunately there is no real average cost of tuition. Different factors affect the total cost such as level of degree, courses you may have already taken and whether you receive any military or other benefits. As an example, Southern New Hampshire University charges $960 per course for undergraduate online programs; with active duty military status, you will pay $675 per undergraduate online course. Graduate courses cost $1,881 for non-military students. While there are no number-specific averages available due to the varying nature of online programs, you can expect to pay substantially more for an online graduate degree than for an undergraduate one. Speaking with a school’s financial department will help you get a clearer picture of the total cost. According to the U.S. Bureau of Labor and Statistics, those with accounting degrees can expect 16% job growth over the next decade, which is about average for other occupations. From 2010 to 2020, the Bureau projects that there will be a change of 190,700 jobs, and in 2010 there were a reported 1,216,900 jobs in accounting in the United States. 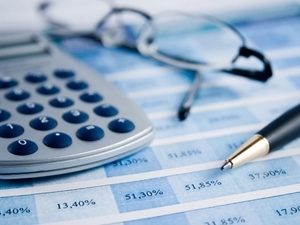 Due to economic uncertainty, accounting remains one of the steadiest industries. As financial balance is restored, accountants will be looked to for guidance. It’s a promising career for those inclined towards this field. According to the Bureau, the average salary of an accountant in 2010 was $61,690 per year. In addition to good job growth, accountants can expect a decent salary, particularly for those who specialize in a field like auditing or earn a certification to become a Certified Public Accountant (CPA). As with any job, experience and certifications result in higher pay. An online accounting degree is a particularly flexible way to get started towards your career as an accountant.